Casey never settles for the simplistic answers. I loved this intense window into the American home front at this crucial moment in US history. We face many of the same issues in our culture today. Casey gives us the fullness of history without ever losing the page-turning excitement of a mystery. Casey’s books offer much more than a who-dunnit—although I always enjoy watching Alafair figure out who the real culprit is. This latest novel continues the historical richness and depth. This time the sophisticated layer of history involves the notion of public opinion—that fearful force the “all men fear” and how it can transform a cooperative society like the town of Boynton into a self-destructive mob. Defining patriotism is a tricky process and not all the residents of Oklahoma come up with a subtle and intelligent understanding. Vigilantes go after citizens with German-sounding names and see spies hiding everywhere. The brick company suffers from sabotage and shift supervisors turn up dead. There is real danger and death, so just where do the boundaries lie? Who are the good guys and who the villains in time of war? And what about the enthusiastic patriotism of young Charlie Tucker, 16 years old and sure he knows who is at the heart of the trouble. You’d guess right if you realize Alafair is never going to let her son face that alone, no matter how much he tries to slip away from her mothering. As with all the Alafair Tucker books, this one is strongly grounded in Oklahoma history. 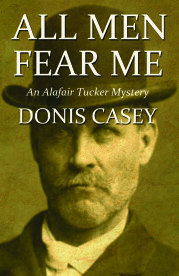 Casey tells the history in detail as the book works up to its unexpected conclusion. The Alafair Tucker books are among my favorites. All Men Fear Me is an excellent addition to the series. Joe Barone, Nov. 15, 2015. Alafair Tucker has been likened to Ma Joad in Steinbeck’s classic, The Grapes of Wrath. In many ways that is a perfect description, and if she is Ma Joad, her brother Rob is Tom Joad. America’s entry into World War I seemingly brings all the world’s problems right to the doorstep of small Boynton, Oklahoma, and as author Donis Casey describes the world Alafair Tucker and her family are living in, readers are reminded that things really haven’t changed all that much in a century.